The left hand’s job is to change the pitches of the banjo strings to get all the notes you need for chords and melodies. The left hand accomplishes this task by pressing the tips of the fingers against the fingerboard just behind a fret, as needed, to shorten the length of a string and make its pitch higher. This technique is called fretting. Rest your left hand on your leg and totally release all body tension from your hand and arm, just as if you were asleep. Your hand should assume a relaxed shape in which all the fingers are slightly bent in toward your palm (Just think of this as the California portion of the lesson and chill!). Keeping the wrist relaxed but straight, place the left-hand thumb on the upper part of the back of the banjo neck, opposite the space between the 1st and 2nd frets. Remember not to support the weight of the neck with the left hand or pull down on the neck with your thumb. And keep chillin’! The hand and fingers should stay relaxed, as in Step 1. Relax your shoulder, arm, and elbow, bringing your elbow down and in toward your body. This should move your hand forward in front of the banjo neck, maximizing the angle that your fingers will use to fret the strings. Move your left-hand middle finger just behind the 2nd fret of the 3rd string and push down on the string, fretting it with the tip of your finger (see the figure). Don’t fret on top of the 2nd fret but position the finger as close behind the fret as you can. Try to maintain a vertical position with the fretting finger so that the adjacent strings are able to ring freely. Try playing the 3rd string with the thumb of your right hand. The goal is to get a clear, ringing sound out of the note you’ve just fretted, with no buzzing. If the new note sounds good, congratulations! You’ve accomplished the first necessary task to becoming a great banjo player, and you’re now officially playing the banjo! 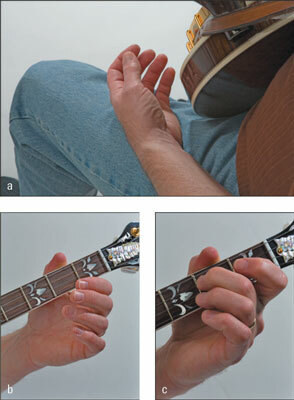 Getting a good left-hand position: Relaxing the left hand (a), positioning the thumb to get ready to fret (b), and fretting the 3rd string at the 2nd fret (c). Now lift up the fretting finger and play the open (or unfretted) 3rd string with your right-hand thumb. As you lift the fretting finger, don’t bring it too far up above the string; position your finger just above the string so that you’re ready to fret again. Now fret the 3rd string again at the 2nd fret and strike the string with the right-hand thumb to check for clarity. Alternate between the open and fretted positions until the movement of your left-hand finger becomes second nature. Remaining relaxed while fretting is important, so every now and then, do a quick mental check to make sure your arm, elbow, and hand are as comfortable as possible. Creating tension by using too much pressure with the left-hand fingers when fretting isn’t unusual for new players. You want to use as much fretting pressure as it takes, but no more. You can find out just how much pressure you need by placing a finger in a fretted position, just barely touching the string. Now gradually apply more pressure on the string with the left-hand finger, striking it repeatedly with the right hand as you go. You literally hear the sound come into focus as you fret. After you’ve passed the threshold where the sound is clear, note how much pressure you’re using with the left-hand finger. If you’re like most people, you may be surprised at how little effort it takes to cleanly fret with the left-hand fingers. The goal is to use just as much pressure as you need to get a clear fretted sound, but no more. Watch Fretting and Changing Chords to see how to put these fretting tips into action.